Now that I am finally getting the swing of things around the new house, home decoration has suddenly become my top priority. I have subscribed to most of the home-decor magazines and retailer's newsletters and created Pinterest boards like this and this one for instance. I have to admit that the more you plow through magazines and emails, you are highly likely to become obsessed with home-decor soon. You'll suddenly see potential in almost every corner of the house, which in a way is good, but not good for your wallet- wonk wonk! When we started looking for furniture for the house, we didn't actually go room-by-room. When we were out scouting for couches, we bought couches for all the rooms that needed one, when we buying tables, we bought tables in all shapes and sizes, including this NESTING COFFEE table. I was always the girl who would get stuck on classic, timeless pieces, but this time around hubs and I decided to keep things modern and sleek- more in the shades of gold. Little did I realize ' how much brainstorming I would have had to do in putting accessories on it' when I ordered this nesting table. 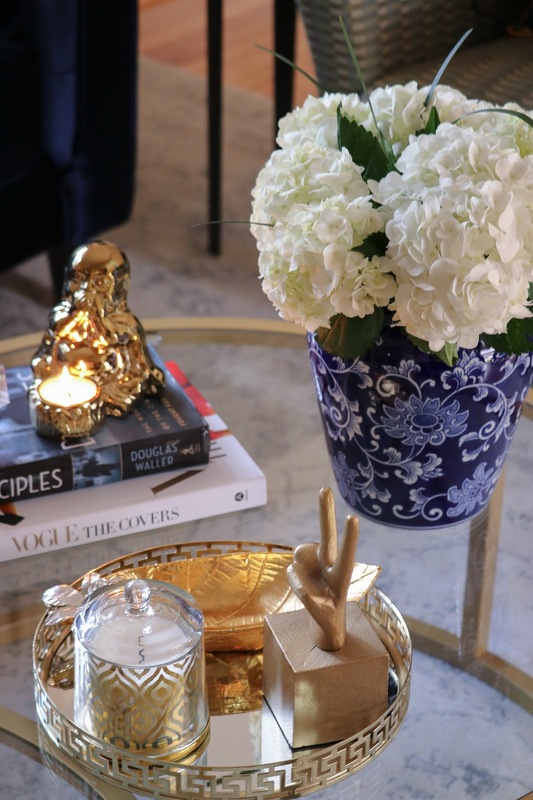 I was stumped with the thought of styling this coffee table - I was clueless, I was dazed. Thanks to all my Pinterest boards, that I had created in anticipation of this day. COFFEE TABLE BOOKS: believe it or not, there is a whole different market for coffee table books. These are hard covered books, mostly pictorial combined as per a theme. These books can be stacked or used as is, depending on the height you are looking to achieve. Use the books as an accessory or to prop something else. They create a visual appeal and look sleek. 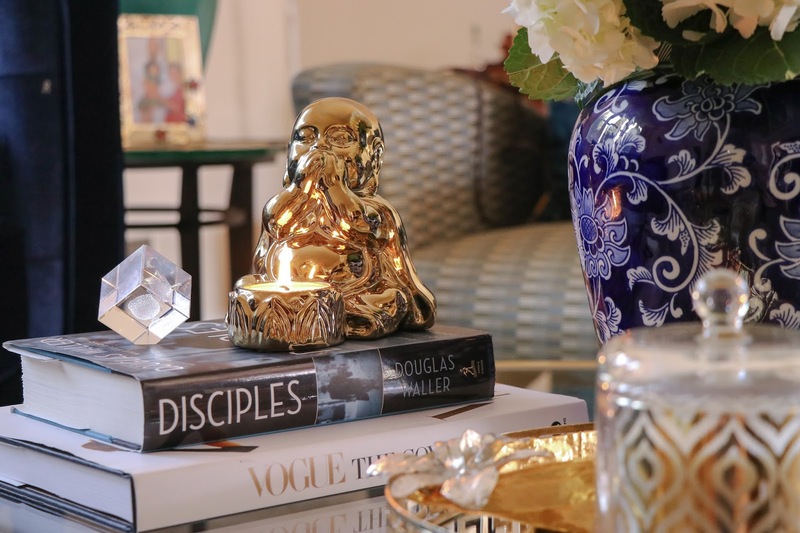 Coffee table books are usually a splurge, but stores like TJ Maxx, Marshalls, and similar discounted retailers sometimes have cheaper alternatives. You could also play around with your graduation hardcover course books to create your own stack. Shop mine HERE. FLOWER VASE/ HOLDER: contingent on the size of your coffee table, and your personal preference choose the size and height of your flower vase. I am a girl who loves to bring in the living-element via flowers, so I had to put some here too. I have a collection of this blue and white porcelain ginger jar, which doubles up as food jars and flowers vases. Since I wanted mine to be the focal point, I plopped this huge bunch of hydrangeas, that I found at my local supermarket. Use fresh seasonal flowers or good quality artificial flowers, the choice is yours. 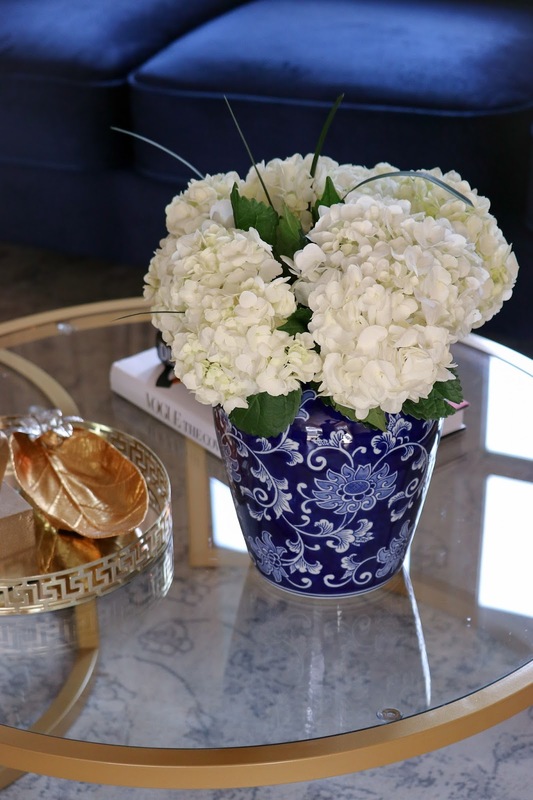 If using a smaller vase, choose the size of the flowers accordingly. TRAY: after the stack of books, the quintessential tray is next. I have picked up a serious obsession for table trays and have a few in wood, in gold, in lacquer, in marble and now in glass. Based on the shape of your table, choose the tray shape. A circular tray goes well with a round table and a square or rectangle one goes well with a rectangular table. 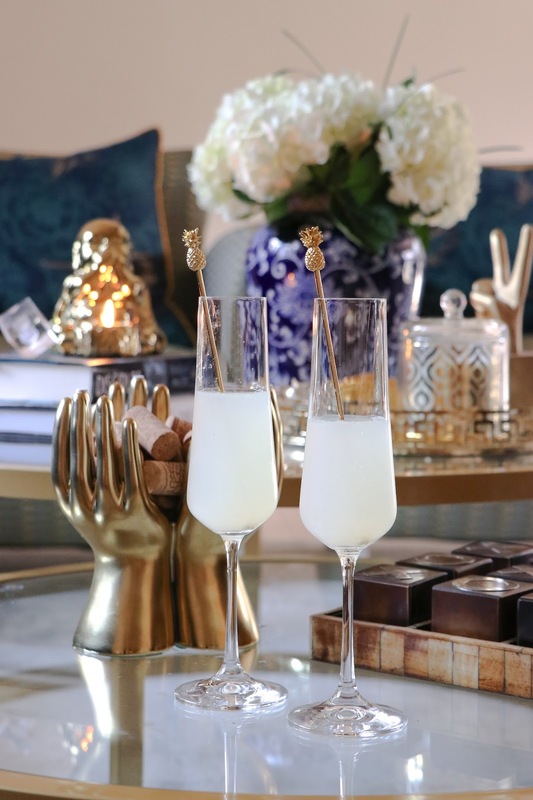 A marble tray can get a bit too heavy if the table has a glass top, but otherwise, a marble tray has its own charm. 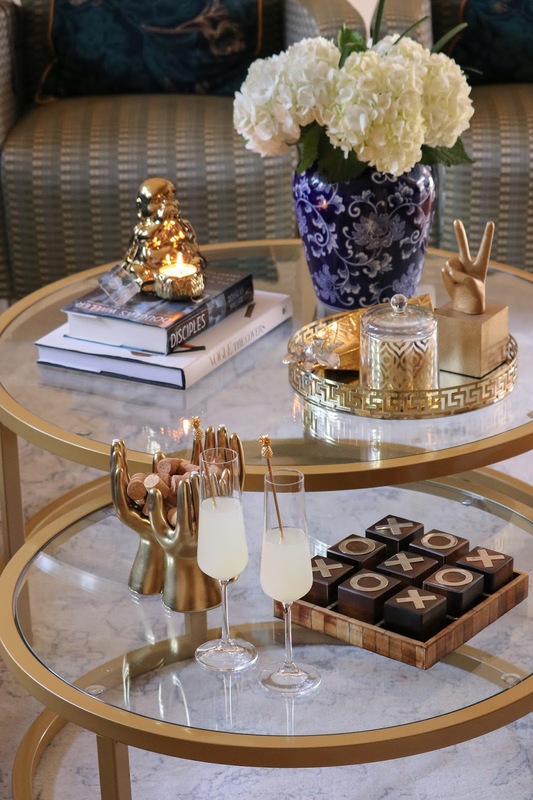 CANDLES: candles instantly up the coffee table game. You can pick out a few or go overboard with them, there is no set rule for this. Think of these as the element that adds color and texture. Mix and match colors and patterns and prints an create your own unique space. My mom had advised me to keep a statue of Buddha and luckily I found this with a candle holder. Dual purpose solved. SOMETHING PERSONAL: when I say something personal, by all means, your personal collectible is implied. Collectibles as in figurines, matchboxes from around the globe, cork stoppers, gemstones and everything in between. 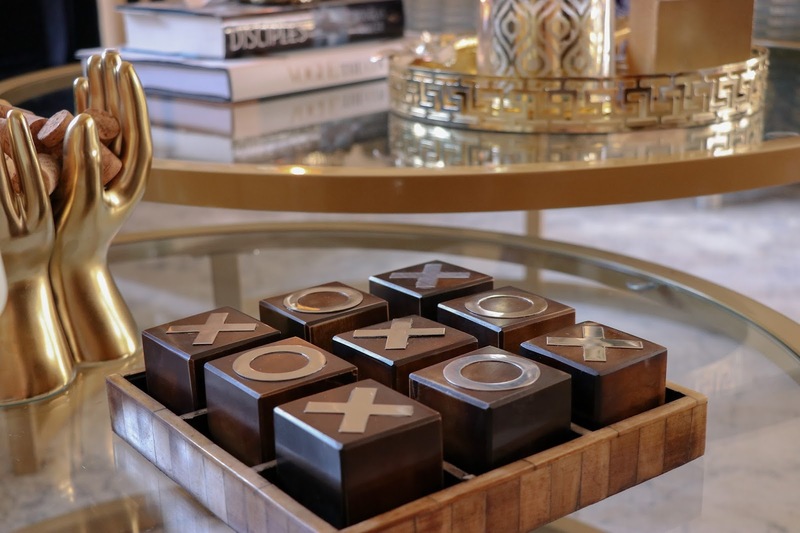 Think of your coffee table as a display case to showcase your collection. Hubs like to collect cork stoppers and I had to use this chance to put it all out. SOMETHING QUIRKY: probably my most favorite accessory type. 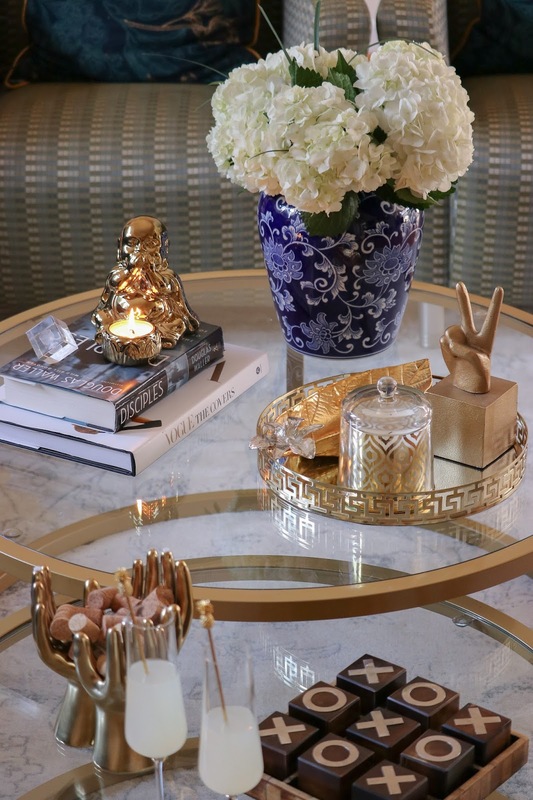 Look closely and you will notice three quirky pieces on my coffee table- one: the three palm vase, two: the peace sign mount and three: the tic-tac-toe set. 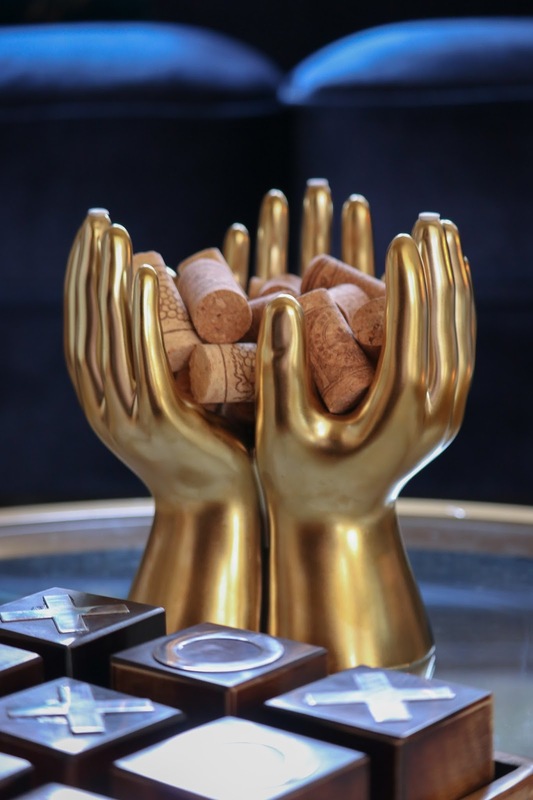 The three palm gold vase was a splurge, considering the size of it, but I had been stalking it for a while and caved in when I found it at a lower price here. It can be either used as a vase or as a holder, just flip upside down. Some people like to add a candy jar or cute catchalls, just play around to give your personal statement to your coffee table. 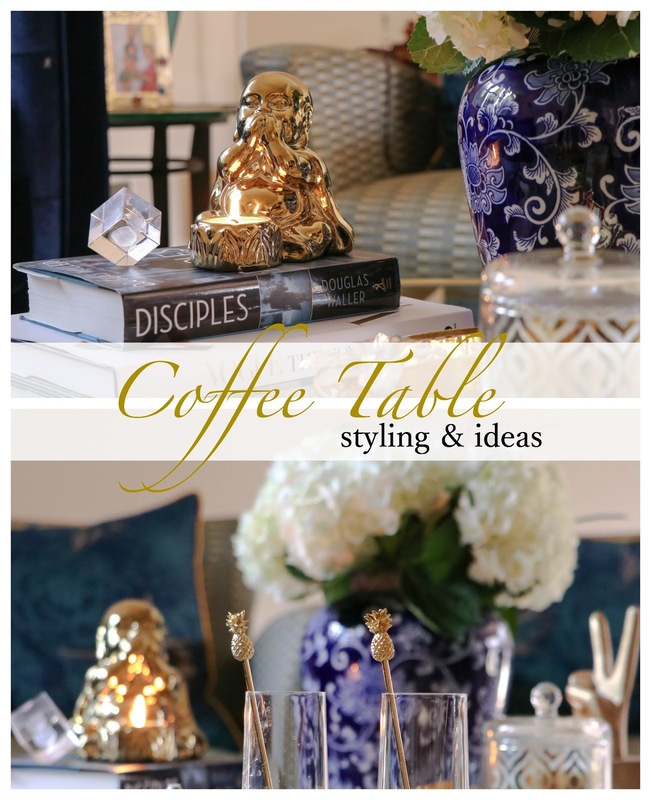 These are some of my essentials for that perfect coffee table vignette, what are yours ?? 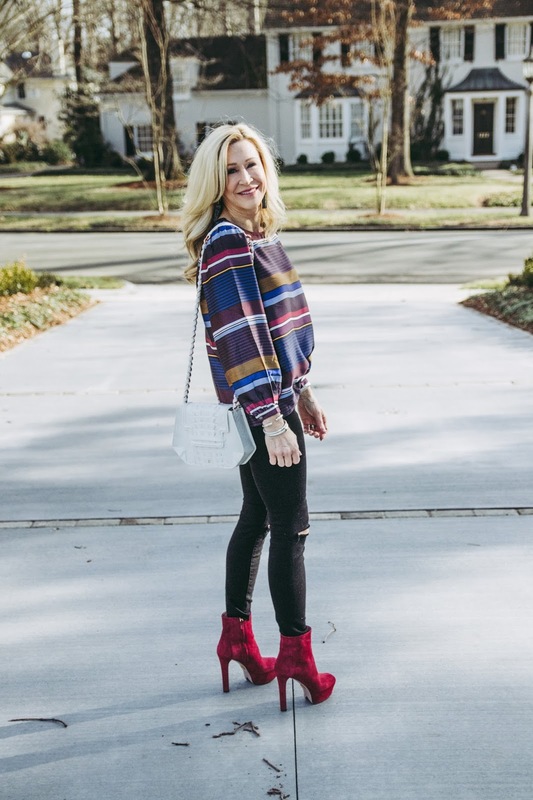 Congratulations to Suzanne of Crazy Blonde life, she is the featured blogger of the week.